Make Sure You Use The Correct Wheels For The Job. 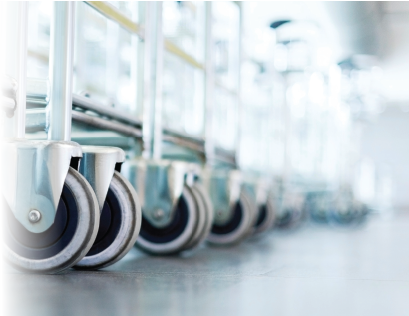 The HSE recommends that regular risk assessments are undertaken before using wheeled equipment, under the Manual Handling Operations Regulations (1992) whether it is a trolley, truck or even a chair. Wheels or castors are designed with a given load capacity and a wide safety margin to avoid problems with overloading, and are also specific to floor surfaces. However, human error can always intervene and cause accidents. For example, a chair with inappropriate castors for the floor type could be used, resulting in an accident for the user, a truck could be unbalanced and overturn due to careless loading techniques, or enthusiastic staff could manoeuvre equipment too quickly damaging the castors and reducing the grip. An Insight Into The Bewildering World Of Wheels And Castors. There are several things to consider when selecting wheels or castors, the choice can be overwhelming particularly given that certain considerations need to be taken into account before the final selection can be made. Environmental considerations are often a major issue. If the wheels are for use externally or on uneven floors then pneumatic or puncture proof tyres may need to be used. If the floor is uneven, then nylon castors may be noisy and so softer tread rubber or polyurethane tyres may be better as they lessen the impact and make for a smoother and quieter run. Consider the application the wheels or castors are to be used for. Specialist tyres are often best for more unusual environments, for example thermoplastic tyres are better in areas of high temperature and hospitals often require clean environment rubber tyres which do not mark the floors. Working conditions vary enormously with regard to both the type of floor and the severity of the application. Load capacity ratings are based on intermittent use on normal truck or trolley applications. Special conditions may apply under any of the following applications or hazards; if the floors are uneven; if there are any ramps; or if the item is towing anything. It may be appropriate, in certain circumstances, to select a castor or wheel with a load capacity much greater than appears necessary. Soft tread (tyred) wheels, such as rubber or polyurethane, give the ultimate in quietness and floor protection, but are not as easy to manoeuvre as hard tread wheels. Polyurethane is able to carry heavy loads and has a great resistance to abrasive wear (many times the life of rubber). It is more mobile than rubber for the same load and is impervious to mineral oils and greases. However, soft tread wheels can only be used with a low capacity load, as the force required to move the equipment would be excessive. In the range of hard tread (or untyred) wheels, cast iron wheels are seen as the strongest and have the longest life, they also have great mobility. However they can be noisy and damage floors. An alternative is the nylon wheel, which can be used in wet environments and also has a high load capacity but is quieter, lightweight and unlikely to cause floor damage. Take a look at the following product highlights, which illustrate the main differences between the types of wheels and castors on offer. With the help of the “Your Guide” over the page you can establish which product would be most appropriate for your needs. Wheels - A simple soft or hard tyred wheel, which can be fixed to a range of mobile items. The material of a tyre tends to dictate the application. Castors - Castors are wheels enclosed within a frame, with a plate which can be attached to virtually any large object to make it mobile. Swivel castors can turn 360 degrees, fixed can move forwards and backwards. Some are available with built in brakes. Accessories - A range of products including levelling feet, glides and locks can be added to improve load mobility and stability. ...to choosing the right wheel or castor. One piece nylon: - Economical, hard wearing and very low rolling resistance, smooth running on flat surfaces. High resistance to breakage and wear. Resistant to most acids and alkalis. Can be noisy on uneven surfaces. Good in areas with debris on the floor. Rubber: - Quiet running. Good vibration absorption. Grey and blue variations are non-marking and provide good protection to floor and load. Suitable for use on most floors. Polyurethane: - High load capacities. Quiet running with good protection to floor and load. Low rolling resistance. High resistance to wear, oils and metal cuttings. Good grip on smooth floors. Will not mark/damage floors. More hard wearing than rubber. Pneumatic: - Excellent performance on poor or uneven surfaces. Kind to floors. High impact resistance. Puncture proof: - Offer the same performance as pneumatic tyred wheels but without the risk of punctures. Thermoplastic: - A perfect solution where the wheels need to withstand high temperatures. Cast iron: - Extremely robust and hard wearing, very high load capacities and able to withstand a broad range of temperatures as well as being resistant to chemicals. Specialist: - Please note wheels and castors are available for more specialised applications, refer to the appropriate sections. Corrosion resistant castors are designed to operate in harsh working conditions. Capacity: - Always be on the safe side, capacities given apply to normal working conditions. For a four wheel application, divide the total load (weight of equipment and trolley kg) by three to give a required load capacity (on uneven ground only three wheels might be in contact with the surface). Castors are available in pressed steel or (for more demanding applications) fabricated steel. Size: - A larger wheel will tend to smooth out unevenness and be easier to roll. Larger diameters will usually have higher load capacities. Bearings: - Wheels fitted with bearings will not carry more weight but will be easier to move. Plain: - The simplest type of bearing which is a bearing surface with no rolling element. They are compact and lightweight – suitable for light to medium loads. Roller: - Allows the load to be spread over a larger area allowing the bearing to handle greater loads than a ball bearing. Ball: - The purpose of a ball bearing is to reduce rotational friction. They tend to have lower load capacity for their size but are long lasting. They also absorb axial load when being towed. Fixing wheels: - Hub width and bore can be critical.